Begin your Aquarium adventure on our Florida Wetlands Trail. Winding through a vast mangrove forest, you’ll encounter river otters, free-flying birds and native fish. Continue to the second floor of the Wetlands gallery and enter Journey to Madagascar. Filled with Ring-tailed Lemurs, hissing cockroaches and colorful chameleons, this exhibit captures the unique Island of Madagascar and the diverse animals that call it home. The next part on your journey will take you through Bays & Beaches where you’ll discover a Goliath Grouper and other species that call Tampa Bay home. Be sure to make a stop at Stingray Beach where you can touch stingrays and sharks! As you travel onward, descend deeper into aquatic environments where you’ll discover stingrays, reef fishes, sea turtles and our massive Sand Tiger Sharks! After exploring all the exhibits inside, you can also come aboard our 72-foot Wild Dolphin Cruise catamaran for an excursion around Tampa Bay to see wild dolphins and seabirds in their natural habitat. Reservations and an additional charge are required for the Wild Dolphin Cruise. In 2014, the Carol J. and Barney Barnett Learning Center opened and began providing innovative student programming using dynamic learning spaces. You’ll be amazed by our Open Ocean, Green, and Coastal Rooms, as well as our colorful replica of a typical Florida backyard for pre-kindergarten through first grade students. This space allows students to explore local habitats and to develop an appreciation for the outdoors. For upper elementary, middle and high school, our dedicated laboratory enables students to dissect marine animals, examine sediment, classify marine invertebrates, and study the chemical properties of water using state-of-the-art technology and scientific instruments. There are programs for every age level! With our pricing structure, programs are easily combined with general field trip tickets. Science, Social Studies and Language Arts. It will take approximately 1.5-2 hours to walk through and see everything. Minimum is 15. No maximum for a group. Students can bring a brown bag lunch or can pre purchase lunch at Café Ray. 1 free chaperone for every 10 students. Additional chaperones pay the same as students. Special programs are an additional fee. See website for details. 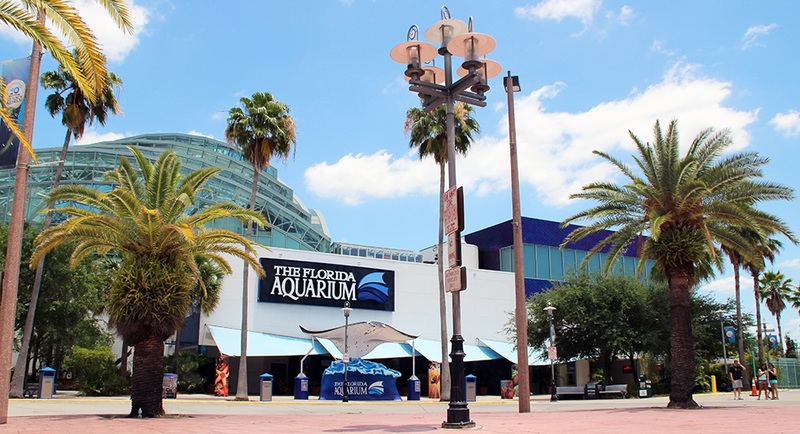 Busses park for free and should proceed to the drop-off location on York Street* (Port Terminal 3), and watch for an Aquarium Team member to greet your group. If there is a ship in terminal 3, drop off will be in the front of the building.